Long Wharf, usually a popular walking destination, was partially flooded, cutting off some parts of the wharf to those without rain boots. 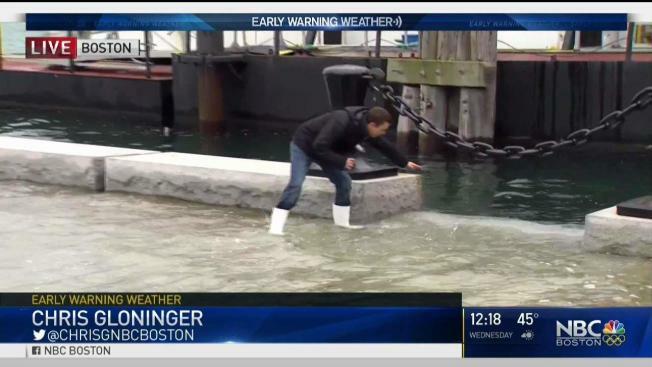 An astronomically high tide coupled with a rising sea level resulted in a "king tide" in Boston Tuesday afternoon, causing some minor flooding. This is the second "king tide" in Boston so far this month. There was some minor flooding Monday as well. The term "king tide" took root in California several years ago, but is more formally known as a "perigean tide," caused by the moon in perigee, close to the earth, increasing influence on tidal heights. Since the high tide in Boston was around noon, it’s unlikely that additional areas will flood. The higher tides have made a significant impact in other cities in the country, including Miami, Florida, where officials had to change infrastructure along the coast.